Resting Easy in the US; Unique Lodging Options for Wheelers and Slow Walkers is finally here!! I always get excited when I release a new book, but I have to say that my newest baby is by far one of my most ambitious projects. But it’s finally complete and now I can breathe a heavy sigh of relief. So what makes this book so different? Well like all of my books, it is meticulously researched. 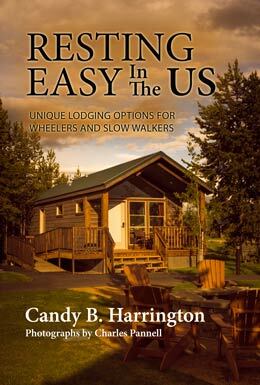 Resting Easy in the US includes accurate access descriptions and detailed photographs of over 90 properties across the US. From B&Bs, guest ranches and lakeside cottages, to boutique hotels, rustic cabins and deluxe yurts, variety is the key word in content. And although access varies from property to property, each one possesses a unique attribute – be it the location, the owner, the room, or maybe even the entire lodging concept. So if you’re looking for something beyond that cookie-cutter chain hotel, this book is for you. But a picture is worth a thousand words – especially where access is concerned – so lots of great access shots are included. And since everyone’s access needs are different, I also included my “take” on who it will — and won’t – work best for. But what good is an accessible property if there’s nothing to do around it? Well I considered that too, so I also included a section with each property about accessible things to see and do nearby. And at nearly 400 pages, it’s chocked full of useful information. In short, it’s a great resource for seniors, parents with stroller-aged children, Baby Boomers, folks who need to take things a little slower, and anybody who uses a cane, walker, wheelchair or scooter. So surf on by www.RestingEZ.com and check it out. And tell a friend!